In this Chapter, we will cover the " Top 10 General Study Quiz for SSC CHSL 2018 " These are the previously asked gk Questions. Let's Start Our " Top 10 General Study Quiz for SSC CHSL 2018 "
01. Which one of the following statements is true about right to information? 02. Who among the following was the first Tribal Speaker of Lok Sabha? 5. Which one of the following is considered as the easily digestible source of protein? 06. Which one of the following pairs is not correctly matched? 07. Which one of the following solutions of electrolytes are used in the car battery? 09. Which one of the following polymers are used for the production of non-sticky pans? 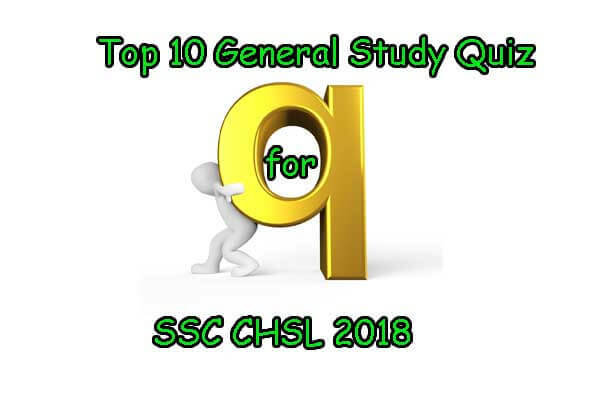 Answers: " Top 10 General Study Quiz for SSC CHSL 2018 "